UK News - Chabad Lubavitch UK Hdqts. The latest news stories about Chabad Lubavitch from around the UK. 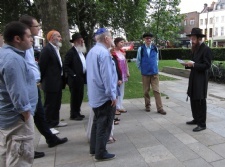 Last Friday, Chabad Islington held a memorial ceremony to remember the eleven Israeli Olympic athletes and coaches that were massacred during the 1972 Summer Olympics in Germany. The event took place at Islington Green Memorial just prior to the Olympic opening ceremony in Stratford. Everyone who took part felt the power of the ceremony and understood the importance of the cause. One lady who partipated said, "I think that this was such a great initiative and a most worthy cause". 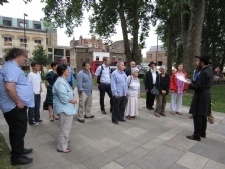 The event was organised by Chabad Islington. This branch of Chabad opened in 2011 and serves the Borough of Islington. It is run by Rabbi Mendy and Rebbetzin Hadasa Korer. This week 80 emissaries, educators, community and campus rabbis from all over the UK convened for the Annual Chabad Lubavitch UK Conference. Spread over two days, the conference provides an opportunity for Chabad's numerous Shluchim from across the UK to meet for discussions and workshops on various aspects related to their work. This year it was held in the magnificent setting of Bosworth Hall Hotel (part of the Brittania Group) in the picturesque village of Market Bosworth, Leicestershire. 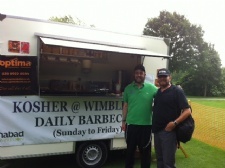 For the 4th consecutive year, Rabbi Dovid Cohen -of Chabad SLSP (South London- Students and young Professionals) has "served" Tennis fans from around the globe with delicious hot and cold kosher food at the Wimbledon Tennis Championships. Situated just minutes away from the legendary Centre Court, the Kosher stand offers burgers, hot dogs, kebabs, strawberries and (parev) cream, and much more. Rabbi Cohen said "Its amazing to see people from across the entire spectrum of the Jewish community coming here to eat. And the most satisfying thing for me personally is when someone who never expected to see us spots the Kosher van, and we see their face light up!"